Stephens, a UNC-Chapel Hill graduate, decided to carry on the family tradition of being a barber. He opened a shop and had quite a following for 23 years. Until one day, loss of balance caused him to fall. A visit to the ER uncovered that fluid was leaking in his brain and surgery ensued. Fortunately, Stephens’ life was saved, but he was unable to ever regain his full balance. His livelihood of being barber was lost. “I was depressed,” Stephens recalls. Drugs became his outlet. He ran through his savings and was forced to live with friends, family, and finally – on the streets. Finally, Stephens turned to Men’s Shelter of Charlotte where he found immediate refuge, a warm meal, a bed, and basic needs. More importantly, Stephens found a lifeline of support to help him develop a plan to move home. Stephens’ Case Manager guided him every step. She connected him to resources to boost his income, helped him navigate housing options, and referred him to other community agencies to build a positive support network to sustain housing. 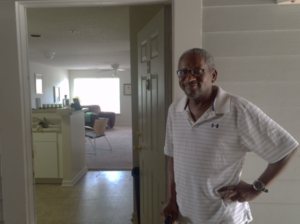 Together, they found Stephens an apartment that was a perfect fit. Stephens moved in and now has a new lease on life! Want to help more men like Stephens? Consider donating today or volunteer your time! Sedrick, Dennis, Toronto, and Dayshawn all have vastly different backgrounds. However, they all share an experience with homelessness, and they all turned to Men’s Shelter of Charlotte for help. Share in their joy as you learn their stories and celebrate with them as they move home.